This article is cross-posted from the blog of former Streetsblog SF editor Bryan Goebel, who’s aiming to launch a new website “devoted to sustained coverage of biking, walking and transit issues in Sacramento, both at the Capitol and locally.” You can also follow Bryan on Twitter. A proposal in Governor Jerry Brown’s budget that would change how the administration doles out federal and state money for biking and walking improvements could imperil critical street safety programs such as Safe Routes to School at a time when California is facing a growing health crisis and trying to reduce greenhouse gas emissions. 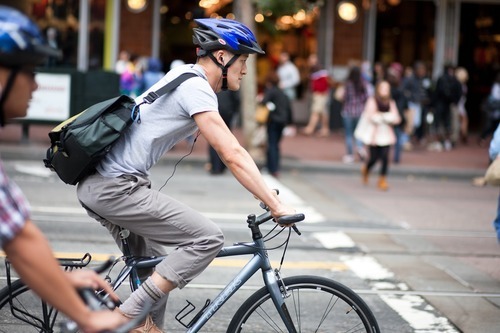 “It does not reflect a serious sense of purpose by this Governor’s Office or the transportation bureaucracy to really make bicycling and walking a central part of California’s transportation system,” said Dave Snyder of the California Bicycle Coalition. The move by the administration is a response to the federal transportation bill passed by Congress last year. MAP-21 ended some dedicated funding for biking and walking programs. States are also receiving less money under Transportation Alternatives, the federal program previously known as Transportation Enhancements, which historically granted the bulk of bicycle and pedestrian funding to state transportation agencies and metropolitan planning organizations. The League of American Bicyclists is encouraging state transportation agencies to make up for the cuts by seeking funding for street safety projects from other eligible pots of federal money. California is receiving $80 million in TA funds, $13 million less than last year. In its current form, Brown’s budget, which has been widely praised for being balanced, would not kick in any other money to make up for the loss. The combined total in the account would be $134 million, compared to $147 million last year. Although the administration has been publicly tight-lipped about the proposal, Deb Hubsmith of the Safe Routes to School National Partnership and other biking and walking advocates who have been briefed say it’s being sold as a way to grow investments in biking and walking programs. However, the current proposal would make the grant process more competitive — meaning money could be siphoned away from biking and walking and into roads and highways — as well as potentially freeze funds and result in lay-offs for Caltrans staffers who have expertise in street safety projects. “It’s critical that this program start the funding level to recent years, that it truly be for walking and bicycling improvements, and that there be no interruption in active transportation funding,” said Hubsmith. The funding cuts would come at a time when California’s fatality rate for bike riders and walkers is almost twice the national average, and the state is working to meet stringent environmental goals. A coalition of organizations is leading an effort to gain assurances that there will be a minimum funding guarantee for Safe Routes to School. According to new data from the National Household Travel Survey collected by Hubsmith’s group, Safe Routes to School has helped to boost annual walking trips in the state among children ages 5 to 15 by 10 percent since it was pioneered in California in 1999. A petition launched last week, led by Safe Routes, the Rails-to-Trails Conservancy, TransForm, California Walks and the California Bike Coalition, urges the Governor “to make the new Active Transportation Program truly transformational for bicycling and walking in the state.” So far, more than 7,000 people and 150 organizations have signed it. While advocates are worried about the way it’s currently written, they also said the program has great promise. “I’m excited about it and I want to be a part of shaping it because I think it has the potential to really elevate active transportation as a priority for California,” said Laura Cohen, the director of the Rails-to-Trails Conservancy’s west coast division. Hubsmith said overall transportation funding for California remains level. If the administration can propose steady funding for road and highway projects, advocates point out, why can’t it prioritize biking and walking? “They know that having choices besides driving alone can save us money, improve our health and our environment, and create long-lasting economic benefits,” said Joshua Stark, the state campaign director for TransForm. The Governor’s Office is expected to release more details Friday, when the budget trailer bills are released, and advocates are hoping to persuade administration officials to crank it up a notch. “We want to see that the structure of this program matches our bold vision for the state of California, and ensures a healthy transportation future for kids and everyone,” said Hubsmith. It is sad that #JerryBrowned is now a thing. No excuse that we don’t have a 3 ft passing law. I get buzzed constantly (especially on high speed roads). Like some of the advocates quoted later in the article, I see the Active Transportation grouping of ped/bike infrastructure and programs as a tremendous opportunity. In the public mind each bike path or program like safe routes to schools seems like a single issue. In reality they are all related and should be funded under an umbrella of better health, safety, and economic growth that comes from funding active transportation. Packaged that way, I think we can make a stronger case for our priorities. While the current 8.8% funding cut for active transportation is not good, the potential upside is great for the future. Governor Brown should be commended for kind of balancing* the budget and refusing to initiate programs that will only get cut in mid-process when state revenues dip. *Still lying out there waiting to be dealt with are the tremendous pension and retiree healthcare obligations the state (and localities even more) have made. The putative 5 billion in surplus funds right now cannot begin to cover that. I recognize that constituency groups’ job is to advocate for their priorities, but the Governor and Legislature have to balance the budget and balance the needs of competing, worthy programs from social services to transportation. I don’t think they should be excoriated for doing that.